Exaggerator Wins Santa Anita Derby For Desormeaux Brothers: Exaggerator finally confirmed the belief trainer Keith Desormeaux had all along in his 3-year-old colt. 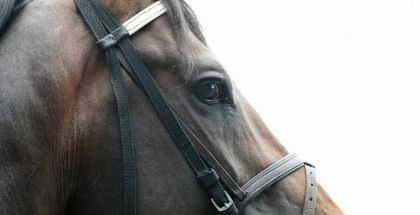 Making an impressive move on a sloppy track in taking the lead in the upper stretch, Exaggerator won the $1 million Santa Anita Derby by 6 1/4 lengths Saturday, beating 7-5 favorite Mor Spirit in their final showdown before the Kentucky Derby next month. Desormeaux has his younger brother, Kent, along for the ride. Kent piloted Exaggerator over 1 1/8 miles in 1:49.66 after they were next-to-last early on in the eight-horse field. Exaggerator paid $8.80, $3.60 and $2.80 at 3-1 odds. Trained by Bob Baffert, Mor Spirit returned $2.80 and $2.40. Uncle Lino was another 2 1/4 lengths back in third and paid $5 to show. Danzing Candy, who had led going into the clubhouse turn, finished fourth as the 8-5 second choice under Mike Smith. Exaggerator made a similar bold move on the far turn in the San Felipe on March 12, only to finish third by 2 3/4 lengths to winner Danzing Candy and runner-up Mor Spirit. 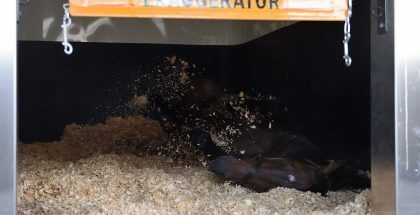 Keith Desormeaux wasn’t sure why his colt was unable to finish. Exaggerator earned 100 points to move into third place in qualifying for the May 7 Derby. Mor Spirit earned 40 points and is in seventh place. Uncle Lino received 20 points, but is in 22nd place and not currently in the Derby field, which has a 20-horse limit. Danzing Candy earned 10 points and is ninth. Exaggerator swerved coming away from the starting gate while Danzing Candy sped to the lead. Exaggerator entered the stretch three-wide and circled the field in taking the lead before drifting to the inside, where Desormeaux went to a left-handed whip in drawing clear. 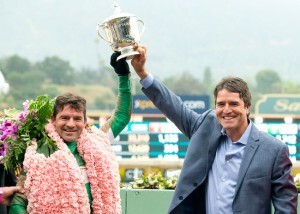 It was Kent Desormeaux’s second career Derby win, and first since Free House in 1997. His brother won the race for the first time. Diplodocus was fifth, followed by Denman’s Call, Smokey Image and Iron Rob. Rare Candy and Dressed in Hermes were scratched. Heavy rain fell early in the day, with fog mostly obscuring the San Gabriel Mountains, creating just the fifth off-track in the race’s 79-year history and the first since Point Given also won in the slop in 2001. The weather affected attendance, with 27,821 on hand. Earlier in the day, Keith Desormeaux scratched Texas Red, who was set to make his 4-year-old debut on turf in the Thunder Road Stakes. 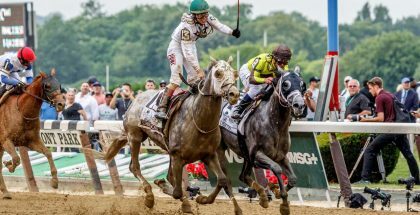 The colt hasn’t raced since finishing fifth in the Travers Stakes last summer. He won the Breeders’ Cup Juvenile in 2014, but got injured and was unable to run in last year’s Triple Crown races. “I’m just going to pray that unlike Texas Red we make it there,” Kent Desormeaux said. — Songbird improved to 7-0 in her career with a 3 3/4-length victory in the $400,000 Santa Anita Oaks for 3-year-old fillies. Ridden by Mike Smith, Songbird ran 1 1/16 miles in 1:44.14 and paid $2.20 to win as the overwhelming 1-9 favorite. A whopping $751,734 was bet to show on Songbird, triggering a minus show pool of $138,844, that was lost by national wagering entities. Smith’s red-and-white silks didn’t have a drop of mud on them with Songbird leading all the way in the Grade 1 race. Mokat was second and She’s a Warrior third. Songbird is headed to next month’s $1 million Kentucky Oaks. — Tough It Out won the $200,000 Echo Eddie Stakes by 4 1/2 lengths under Joe Talamo. The 3-year-old gelding ran 6 1/2 furlongs in 1:17.60 and paid $12.20 to win. — Pacific Heat won the $200,000 Evening Jewel Stakes by 1 1/4 lengths under Flavien Prat. The 3-year-old filly ran 6 1/2 furlongs in 1:17.38 and paid $4.40 to win as the 6-5 favorite. — Decked Out won the $150,000 Providencia Stakes by 2 3/4 lengths for the Desormeaux brothers. Decked Out ran 1 1/8 miles on a turf course listed as good in 1:52.72 and paid $8.60 to win the Grade 3 race. — Kent Desormeaux won his third stakes on the card with What a View, who won the $100,000 Thunder Road by a length. Trained by Kenneth Black, the 5-year-old dark bay ran a mile on turf in 1:39.01 and paid $3.80 to win as the 4-5 favorite in the Grade 3 race. Sunday is closing day at Santa Anita, as the track’s 63-day Winter Meet, which began on Dec. 26, draws to a conclusion with an 11-race program. First post time on Sunday is at 12:30 p.m. and admission gates open at 10:30 a.m.